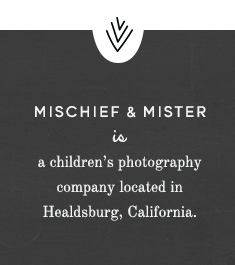 Once upon a time... in a little town called Healdsburg California... we started a portrait photography service for parents of mischievous children called Mischief & Mister. We started Mischief & Mister so that parents could experience relaxing, stress-free, expectation-free, fun portrait sessions. And so they could come away with gorgeous family portraits to enjoy now, and for years to come. Our story is just getting started, we hope you'll join us to see what happens next. Children's and Family Portrait Photographer based in Healdsburg California. What is a Pop Up Session?